Sean Hahessy broke clear in what proved to be the winning escape in the closing stages today and sealed the deal in the sprint to the line to take the biggest win of his career to date. 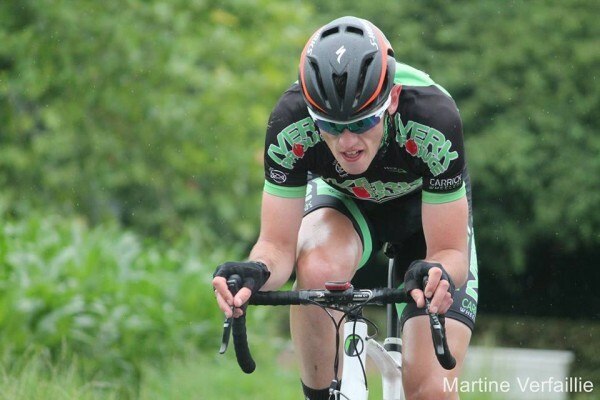 After British rider Dillon Byrne (Champion System-MaxGear) took the opening stage and first yellow jersey of the Suir Valley Three Day yesterday, Sean Hahessy has hit back in great style for the home challenge today. The Carrick Iverk Produce rider broke clear of the peloton in a three man move on an incline with around 15km remaining to the finish on the 92km stage that started and finished in Clonmel. With him in that move were Ryan Sherlock (Top Team) and Jonathan Creegan of UK outfit Team Wallis Cycles. Hahessy was quickest in the dash to the line, taking the stage win after the escape built a lead of no more than 30 seconds on the run in and saw that closed slightly by the finish. Dillon remains in the yellow jersey on a day when 46.5km was completed in the first hour of racing. The team of the yellow jersey were attentive throughout, closing down small groups that got clear and built modest gaps before being overhauled. Among those riders who were aggressive off the front but whose efforts ultimately came to nothing were James Davenport (Cycling Leinster), Javan Nulty (DID Dunboyne). Michael O’Loughlin (NRPT), Keith Gater, Robin Kelly (both Aquablue) and Anthony Walsh (UCD CC), among others. O’Loughlin takes the red jersey of leader of the A3-Junior category. Runner-up yesterday, Bryan McCrystal of Aquablue is still in the green jersey and Chris Reilly (Liquidworx-Fitscience) takes the climbers’ classification lead from Eoin Morton of UCD CC. Gater will wear the most aggressive rider jersey in this evening’s criterium.